When it comes to fruit, I am an apple or berry person, and one of my favorite treats each fall is to make a big bowl of oven roasted applesauce that I divide up into containers and freeze to last me for a month or two. Although I love apple butter as much as I do applesauce, I never made apple butter at home until just recently. I saw a number of apple butter recipes across the internet this fall, but I was particularly interested in the ones that used a slow cooker. When I made my apple butter I used a variety of apples including Braeburn, Jonathon, Fuji, and Ambrosia varieties. The recipe is as simple as peeling and dicing the apples and then throwing them into your slow cooker to cook overnight. In the morning you puree the apples and cook it on high until it has thickened. I do not care for applesauce or apple butter that is too sweet, so I only used 1/2 cup of brown sugar and 1/2 cup of honey. I would suggest that you add 1/2 a cup of brown sugar when you first add the ingredients to the slow cooker, then in the morning, taste the mixture after you puree it, and add more sugar at that time if you feel it is needed. The apple butter does thicken up even more once it cools and is refrigerated after it is removed from the slow cooker. To Cook on Stovetop: Combine all ingredients in a Dutch oven. Cover and cook over medium-low heat 1 hour or until apples are very tender, stirring occasionally. Puree, and return mixture to pan. Cook, uncovered, over medium-low heat 15 to 30 minutes or until very thick, stirring frequently. Apple butter can be used for many things, but I love it slathered on whole grain toast, or spooned on top of my oatmeal and Greek yogurt in the morning. I also love to add a big spoonful into my cottage cheese for lunch, or use it as a filling in baked turnovers or filled cookies. 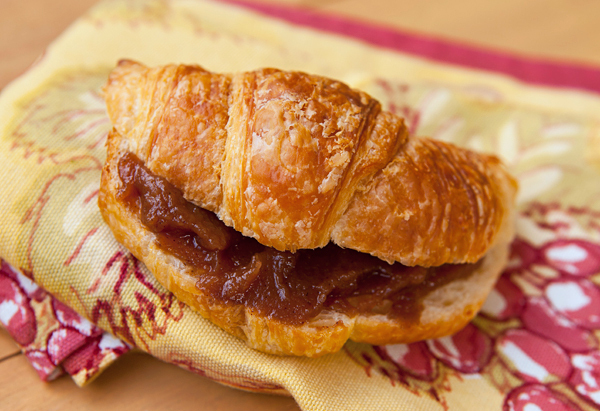 Apple butter is also delicious brushed on roasted or grilled pork. 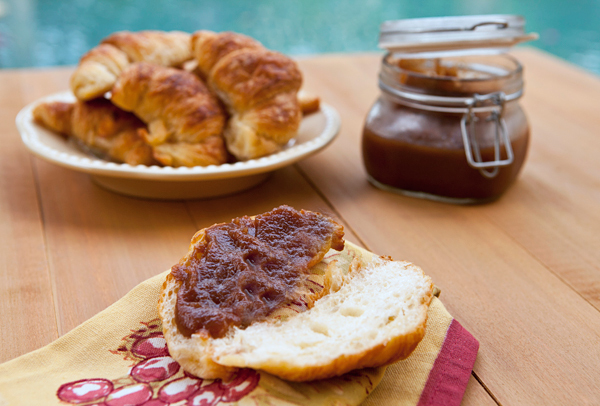 Apple butter is a low fat spread rich in vitamin C & A as well as insoluble fiber. Combine all ingredients in a 5-quart electric slow cooker. Cover and cook on low 10 hours or until apples are very tender. Use a hand wand to puree the apples until smooth, or puree in a blender. Taste, and adjust sweetener as needed. Return apple mixture to slow cooker. Cook, uncovered, on high 1 1/2 hours or until mixture is very thick, stirring occasionally. Spoon into a glass jar, cover and chill up to a week.